3 months or so ago we put out our first list of the best hole in the wall restaurants in Jax. In the mean time we’ve written another 40 or so more reviews and we’ve happened onto many more amazing hole in the wall restaurants we’re excited to share. As with our first list of Jax’s best hole in the wall restaurants, the restaurants on this list are small local spots that have no more than one location and in most cases are flying under the radar. Chowder Ted’s [Update: Under New Ownership] – We regularly ask our readers which small under the radar restaurant is their favorite. 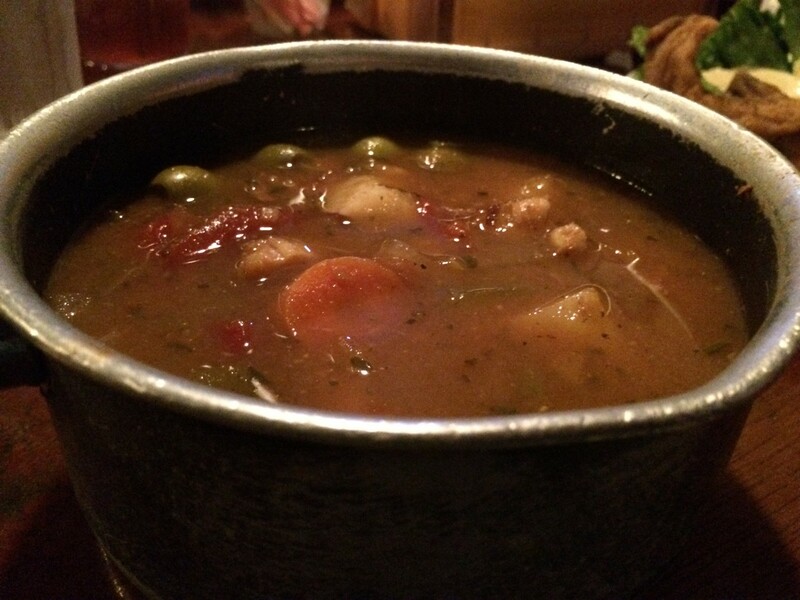 By a landslide our readers recommend Chowder Ted’s over any other place in town. Chowder Ted’s is located a bit North of town on Heckscher drive. They’re famous for their minorcan style chowder. Ted’s chowder is a broth based chowder full of shrimp and clams, along with potatoes, carrots, celery, and surprisingly, green olives. It has many layers of flavor and grows on you the more you eat it. Ted’s is a fairly small place with a few tables and bar style seating right in front of the open kitchen where you can watch Ted and crew cook up your food right in front of you. After you finish eating you can walk out back and admire the amazing ocean/intracoastal waterway view just behind the restaurant. Nile Ethiopian Restaurant– Eating at Nile Ethiopian is a true food adventure. You probably won’t be familiar with hardly anything on the menu. You won’t get silverware and you’re virtually guaranteed that almost everything will be pretty spicy. The food at Nile tends to be served family style on a big platter on top of a sheet of injera. You use this light, airy pancake-like food called injera as your eating utensil. You rip off a piece of injera and use it to grab some of whatever food item you’d like to enjoy. Eating at Nile Ethiopian will likely be different than almost any other eating experience you’ve had. Everyone should try it at least once for the experience. On our visit, the food was pretty good too. 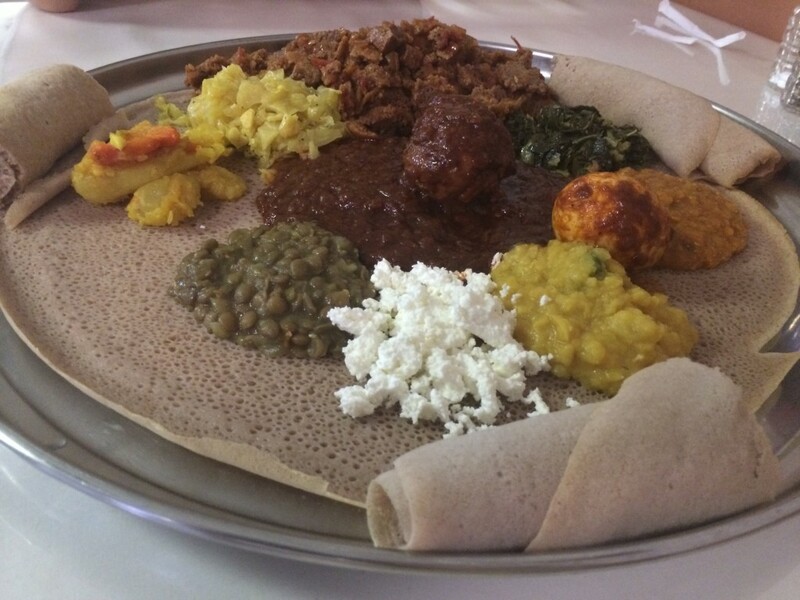 Nile Ethiopian is located at 6715 Powers Ave.
Mama Q’s Pizza – We love Mama Q’s pizza. They truly use better ingredients than the chains(yes, better than Papa Johns “better ingredients”). They make all their dough in house. The place is spotlessly clean! We even talked them into letting us walk into the freezer where we found everything perfectly organized and labeled. Mama Q’s pizza is really, really good and they offer a whole bunch of styles that no other place in town offers. Like clams? Try their clams casino pizza. Love mashed potatoes? 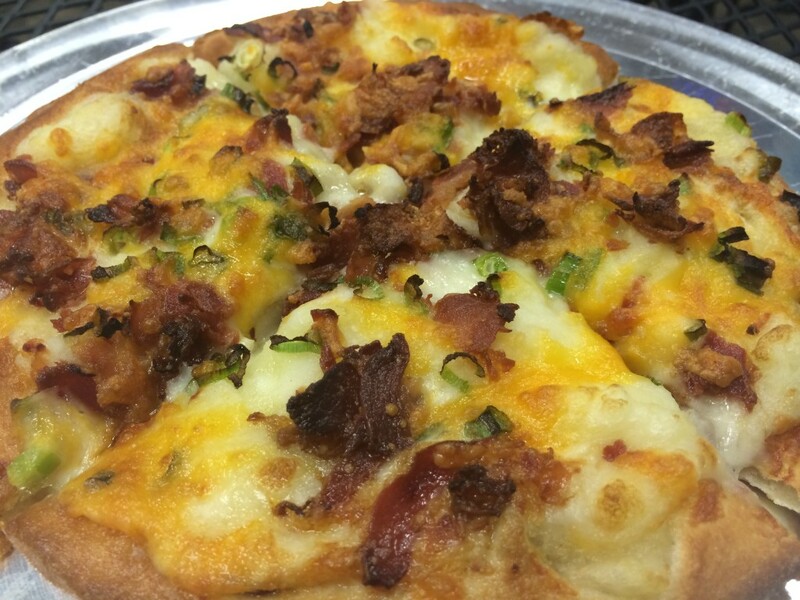 They have an awesome mashed potato pizza that one of their most popular pies. The bacon on their pizza somehow comes out fantasticly crispy every time and their maple cinnamon desert sticks are heavenly. Best of all, they deliver if you live within a few miles of their Old St Augustine road location in mandarin. Hungry? Here’s their number so you can call them for delivery 904-260-MAMA(6262). Pie Heaven – Pie Heaven is a true hole in the wall. The space is tiny. They have two tables and people generally order pies and take them to go. When you think of a pie place you think sweet pies. These guys actually have sweet and savory pies. The savory pies are absolutely amazing! As far as savory goes we absolutely love the chili pie. Amazing meaty chili surrounded and topped by a cornbread crust? Oh my!!! As far as sweet they offer just about any fruit you can imagine and a whole lot more. Pie heaven is located in Mayport on Mayport rd. Believe us when we tell you it’s worth a cross town adventure if you live on the other side of town. Best pies in town? Try them and tell us what you think in the comments. Sweet Theory – Holy vegan donuts! In a previous article we declared The Donut Shoppe’s donuts the best in town. We hadn’t tried sweet theory’s. Sweet Theory’s donuts blew us away. Sweet Theory makes their donuts with no milk or eggs. They’re a bit heavier than your standard donut and oh so tasty. They offer a wide variety from the basics to root beer flavor, maple marshmallow, pineapple coconut and many many more. Their selection is a bit different every day. The one negative with Sweet Theory is their donuts are the most expensive in town by a mile. How does $24 for a dozen sound? My wallet hurts just thinking about it. The quality justifies the price though. They are awesome! They also have tons of other vegan breakfast items that even this meat lover will admit are fantastically good. The coconut bacon sandwich for example, which contains coconut flavored to taste like bacon that comes really close to the real thing. Watch out for weird hours when you go to visit Sweet Theory. They don’t open til 10am and they’re closed Monday and Tuesday. I guess when you have amazing food people will show up when you want them too. 4 Bones BBQ (Closed) – These guys are probably on the upper end of what we’d consider a hole in the wall restaurant. They’ve probably got 12 to 14 tables. Since most of Jacksonville hasn’t heard of them they just barely made the cut to fit our criteria. They’re tucked away in a shopping center at Beach blvd. and San Pablo road. 4 Bones offers a wide variety of barbequed meats, from the expected pulled pork and brisket, to less common Carolina chopped pork and chorizo. 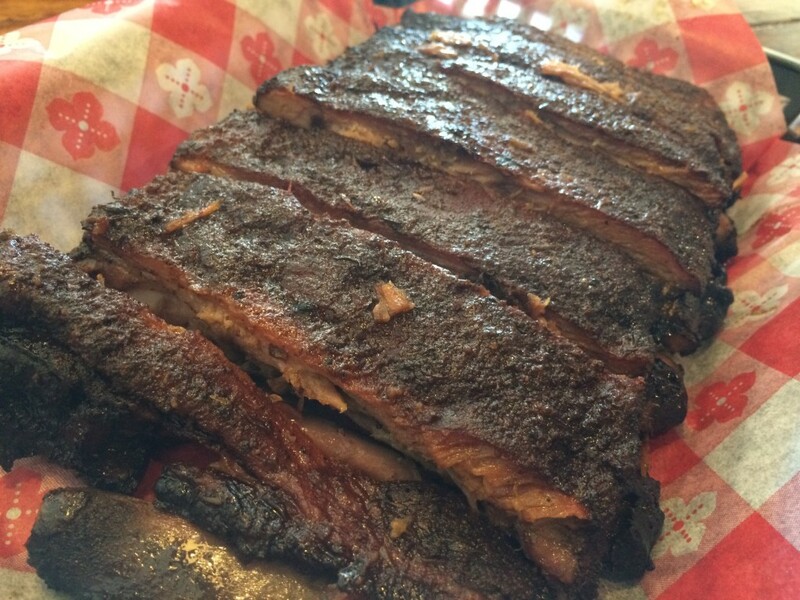 While everyone’s opinion will differ we absolutely love their St Louis style ribs! The meat falls off the bone it’s so tender and it’s full of smokey flavor. One of the coolest offerings on the menu at 4 Bones is the chivito- grilled steak, bacon, ham, fried egg, cheese, lettuce, tomato, and mayo. Bring your appetite if you try that one! The owner works the counter every day and his passion for great BBQ just oozes from his pores. When you try 4 Bones BBQ you’ll see that passion shines through in every single item they serve. My Mama Q’s experience was so bad it makes me want to question your other choices. Pizza was very small for the price, and the taste was far short of desiring a second try. Staff was not friendly either. That’s a requirement for a hole in the wall. Sorry to hear your experience was bad. Our experience out there was pretty much the exact opposite of yours. The wings we had were not good…but otherwise the pies were great and service was top-notch. Going to have to agree with the reviewer, Mama Qs has some of the best pizza in town. Their sauce is phenomenal. Your lack of “Hon Korea” is disturbing. I love Hana Yori!!!!! Best food, awesome service, and prices can’t be beat!! Don’t going during peak times unless you don’t mind waiting. You go as a first timer and leave as friends!! El Mofongo of 103rd deserves a mention – their roast pork lunch special on Fridays is amazing, and for $6 bucks it can’t be beat. You should check out Mikey’s Pizza on Beach Blvd. it’s our favorite pizza place. It even beats some of the gourmet pizza places here in town. The family that owns it is from Turkey and they are extremly nice. I’ve heard Mikey’s is one of the best and I’m anxious to try it. Pie Heaven is like having an slice of Heaven with every bite. The coconut cream was the best I’ve ever had, the chedder, basil and tomato is beyond super good and the chicken pot pie is exceptional – oh the apple pie, lemon pie and every other pie is so worth having. A small place with big flavor and the best ingredients. Enjoy the friendly, peaceful atmosphere while you savor every delectable mouthful! Giving Pie Heaven the benefit of the doubt… because maybe I got the one and only bad chicken pot pie they’ve ever made, but it was soooo dry. The small bit of sauce was flavorful but was quickly absorbed by the top crust that fell into it. And frozen mixed veggies? I really hoped for a lot more. Chowder Ted’s Swamp Burger and a pot (an actual pot) of chowder is one of the best lunches in Jax.